The video directly below explains the stage of late addiction. It is almost impossible for a drug or alcohol addict to stop taking drugs or drinking and staying normal unless he or she gets some help from the outside. Moreover, unless he or she gets some real pressure from the outside he or she will not do away with his or her habit of drinking alcohol or taking drugs. Various people can help bring about this pressure including friends, family, clergy, various health care professionals, judicial authority, law enforcement or even an employer. A spouse, for example, may threaten a divorce, or the addict might be arrested for drinking and driving. This intervention is sometimes a pivotal point in the addiction treatment stage. Earlier it was believed that unless an addict and alcoholic had hit rock bottom he or she could not be helped. There is a reason behind this theory. Many addicts in their beginning and middle stages did stop taking drugs or drinking alcohol when they were threatened with consequences like a divorce, losing a job or a physician’s persuasive warning that reflected the consequences the addict might have to face if he does not stop taking drugs or drinking alcohol. It obviously will be great to get the addicted person treated as early as possible. One of the advantages of getting addiction treatment on time is that there will be brighter chances of opting for a treatment that is not too expensive, like outpatient care. The chances of a treatment succeeding increases when the addict has not made his life much miserable, and can still easily move back to a normal healthy life with his family and friends, and can still continue with his job. The employer also is at a lower risk since he knows that if the disease is treated at an earlier stage his employee will recover soon and will be able to start working properly quite fast. If treated at an early stage there are fewer chances of disruptions and further poor performance or misconduct can also be avoided. However, if the addict gets help at a very late stage, then various harm already will be done that perhaps cannot be repaired ever. In the initial stages the alcoholic or addict might not really need help or a push to go and opt in for a treatment. People generally opt in for a treatment since they get threatened with a loss of job, an incarceration or may be a divorce. Even if an individual does not to be forced to opt for a treatment, it is important that he or she understands its importance for it to actually work. Employers generally have a very strong role to play in making the addicts opt for a recognized addiction treatment. The fear of losing a job usually is a big push for the addicts, making them consider a treatment. To get rid of addiction there are various types of programs and treatment. There are some drug addicts and alcoholics who themselves stop taking drugs and alcohols, but then this is very rare. 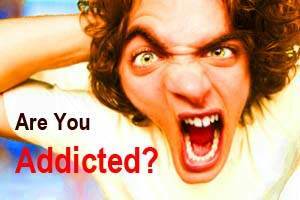 Most addicts or alcoholics need some kind of help or treatment. It is not necessary that a relapse means starting consumption of drugs or alcohol regularly, as it can also be just for once. However, if there is a relapse it must be treated on time and must be considered as a part of the recovery program that has not been treated properly. Relapse has been gaining immense importance and researches too are going on to find a solution for the same. Relapse prevention should be a part of any highly effective treatment plan. 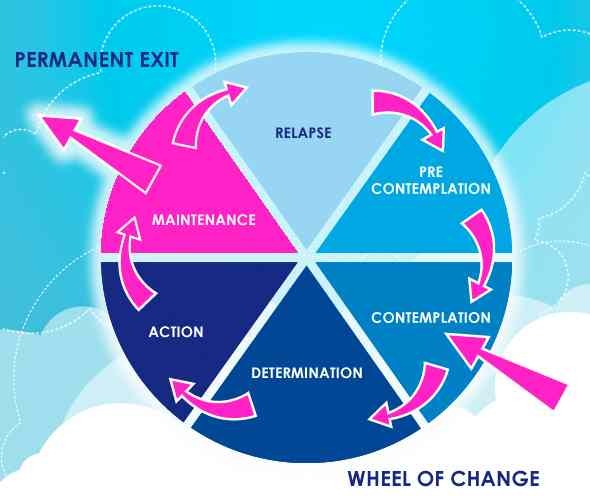 Below is the wheel of change developed by Prochasca & Di Clemente. This has been an exceptional visual tool to help A&D practitioners & clinicians explain the various stages of addiction and walk with clients through their journey. The video directly below introduces the stages of change in relation to addiction. Most addicts start off using the drug as a form of recreation. For them it is a harmless fun that they enjoy occasionally with some friends. Unknown to them, they are already exhibiting signs of addiction that is becoming a growing concern among family and closed friends. If confronted, they deny being an addict, asserting that they have control over the vice. The addict gives his habit a thoughtful observation and may think about stopping it. Usually this is not because he believes that his drug use is a serious problem, but because it could have triggered an unwanted situation that made him think of stopping or limiting his drug use. For instance, he may have failed to do his report at work or his mother made a big issue out of his bad habit. At this stage, though, the idea of actually ceasing from the use of drug is not taken that seriously. Here, the addict finally admits that drug use is affecting his life negatively and starts making plans to finally stop it. He may reach out to family and friends to discuss his plans, and he might even ask for help or suggestions. Despite this positive attitude towards quitting drugs, though, those close to him should exercise caution because some addicts use this tactic to make other people believe that they are stopping just to avoid the incessant nagging. If the addict was actually not bluffing when he said that he is quitting, expect him to proceed to this stage, where he actually makes deliberate actions to seek treatment. He may join a therapy group that deals with reforming addict or, if his addiction is bad, he may confine himself in a rehab center. As his family and friends, you must support him every step of the way and aid him in seeking these treatments. Getting rid of drug addiction does not happen overnight. It may take weeks, months, or even years, depending on the degree of addiction, the determination of the addict to change, and the support that his family and loved ones are giving him. Hence, you cannot say that an addict is saved once he enters a rehab. It is a continuous process that requires the involvement of the family. As much as possible, family members should check on the status of the treatment and they should intervene, if necessary, if they think that not enough action is taken towards stopping the habit. Failing to give this stage the utmost importance it deserves could result to failure in treatment and the addict could slip back to the previous stages. Right here and now, the addict is showing signs of wanting to change, thus give him all the help he needs to achieve that. Unfortunately, relapses do occur among addicts, especially if they have been on the habit for far too long. It could also be because some addicts are not emotionally prepared to join back society after the ordeal, and so they easily get tempted to use drugs again. This is why it is important that the root cause of drug use be pinpointed during therapy so that counselors can address this and be able to work with the addict at facing these problems. A relapse is very devastating for both the addict and his family. All the effort put on treatment goes to waste in a snap. Even relationships that are starting to be rebuilt goes crumbling back down again. Everyone ends up going back to square one and if this happens over and over again, even the family that the addict relies on may finally give up and admit their limitations. The road towards treatment from addiction could become a vicious cycle if the addict fails to maintain being clean from drugs. He should understand that being in and out of rehab is not a game that should be taken lightly. His family, especially, will reach a point of exhaustion where they may want to raise the white flag and just give up. All the while, during the action plan, the family has always been there to carry part of the burden, but if they see that the addict is not doing his part seriously, they may let go of that burden and hand the full responsibility to the addict. This is why, during the treatment stage, families of the addict should also undergo some sort of therapy to prepare them for the task ahead. They can join support groups that were built specifically for families of addicts. These groups can offer sound advices, emotional support, and recommendations at handling the treatment of an addicted relative. Without this support, families of addicts may give up easily, which could affect the addict’s road to change. The video directly below talks about the family system in relation to a family members addiction problem. It is important that the addict and his family should not give up hope in this intricate cycle of addiction because, believe it or not, a full addiction recovery does happen to many addicts. As mentioned, treatment from addiction does not happen overnight. It is a long process that the addict should adhere to if he really wants to change and improve his life. The road to full recovery is not easy, but it can be achieved if you do it right. For instance, if the treatment plan or facility that you have enrolled to is not helping you improve your condition, then the addict and his family should take steps to change their action plan. It may mean going to a new rehab center or seeking new counselors. In other words, do whatever it takes to achieve addiction recovery because it is better to do this right the first time than suffer the risk of a relapse. You should also give importance to aftercare services that will keep track of the addict’s progress. Counselors often hold meetings and one-on-one sessions with recovering addicts to ensure that they are doing well and to address any problem that they are encountering. This makes it easier for the addict to get back to his normal and healthy life, giving him and his family a bright new start. The video below featuring renowned addiction specialist “Dr Gabor Mate” delves deeper into the state of addiction and how it can develop from childhood.